It had to happen – no decade is complete without an attractive Alfa Romeo, and the GT is that car for the 'noughties'. Although it looks the business, in truth the car has more in common under the skin with the firm's 156 than you might think. The decision was a good one; the front-drive GT drives well and boasts a flamboyant cabin. You can be forgiven for thinking that Alfa Romeo's GT is a one-trick car. After all, judging by looks alone it's easy to get that impression. The Italian company has a long history of making bold design statements, but in recent years it's struggled to follow them up with solid performing cars. To large extent the arrival of the firm's 156 changed all that. From an aesthetic point of view it could do no wrong – an act that was confirmed by a flood of critical acclaim. But it also successfully took the fight to the likes of BMW and Audi on the road. Why mention the 156 in the context of the GT? In some respects there are parallels: the extrovert exterior, individualistic cabin design, good road manners and a thumbs up from the critics. The GT also shares some of the 156's platform and engines, and it's the latter array of components that make the GT shine. There's also the issue of price when discussion turns to small coupes. With the German makers largely dominating the market and the traditional volume sellers – Ford, Vauxhall – unrepresented, high prices prevail. That the GT is one of the more affordable options is worth a cheer. That is does more than just look pretty is cause for celebration. Look in a dictionary under 'head turner' and you'll see a picture of Alfa Romeo's GT. Alright, so that might not be strictly true, but from behind the wheel it feels like a reality. 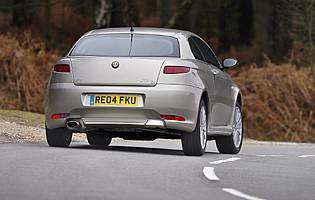 Thankfully the car's abilities largely match its looks, although a few old-school Alfa quirks remain. Crucially the GT is an affordable coupe, and offers a welcome change from the often costly cars from the likes of BMW, Mercedes and Audi. There might be a lot of competition in the coupe sector but of it comes from the premium end of the market, putting the GT at a distinct cost advantage. Also in its favour is its high level of standard kit. Opt for the JTD diesel variant and you'll feel the savings at the pumps, too. Insurance and servicing won't be at Ford or Vauxhall levels of expenditure though, and residuals will struggle to mirror those of a BMW or Mercedes. The GT's rear accommodation might be on the small side, but at least the rear seats split and fold hatchback-style. This welcome boost in versatility makes loading large quantities of shopping much easier. Cabin space is acceptable but cannot match that of a conventional family hatch. The glovebox is also modest, but the few oddment bins and trays do make a difference and the front armrest can swallow small valuables. Alfa Romeo's trademark trio of cowled dials dominate the car's fascia. They are functional too, and also house the comprehensive trip computer. Moving to the centre of the fascia, the car's stereo is located high up, but its buttons are small and fiddly. The same cannot be said of the ventilation controls, which are of the rotary kind complete with small digital displays showing the corresponding settings. Disappointing, Alfa has chosen red as the main backlight, and this can make reading the instruments difficult at night. Also odd are the quartet of column stalks. This is really overkill as the number could easily be halved. 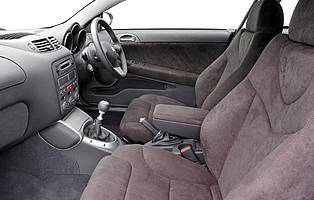 It's difficult to find complaint up front; as far as compact two-door coupes go the GT's cabin is cosy. The driving position is better than Alfas from the past, although more headroom would be appreciated. With rear seat accommodation realistically a token arrangement, asking adults to sit in the rear for any length of time would be foolish. Being a sporty coupe the GT's ride is firm, and this is reflected inside the car. Uneven road surfaces plus road and engine noise are all more obvious than in a regular hatchback. When a car has been designed to stand out from the crowd, you do need protection. Thankfully, Alfa provides remote central locking with a electronic code plus an alarm an immobiliser. However a visually deterrent, such as a steering lock, would be a good low cost investment. Alfa Romeo might not shout about its safety credentials in the way Renault does, but the GT does come with twin front, side and curtain airbags as standard. Active safety features run to anti-lock brakes plus a comprehensive electronic stability system. For added safety and convenience, more powerful xenon headlamps can be found on the options list. It's a cliche but even when standing still the GT looks like fast and exciting. The driving experience remains essentially loyal to this premise. Contrary to tradition, the driving position is acceptable and the view forward is good. The three engine options infuse the car with equally different personalities. The 2.0 JTS variant is rev-happy and needs to be driven hard; the JTD model prefers a smoother approach but the results are no less enjoyable, while the V6 can be a monster – it will growl and bark its way around corners and along straights. Overall the ride is predictably firm, but not uncomfortable. The big surprise is the steering, which is fast and accurate if lacking in a little feedback. The GT is definitely not a family friendly car. The rear seats could be seen as ideal for children, but the modest levels of access could prove frustrating – despite the admirable inclusion of Isofix seat mounting points. 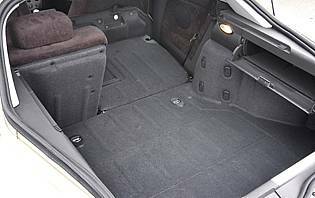 It would make more sense as a second car, but keeping the nice upholstery clean might be too much of a challenge for some smaller passengers. 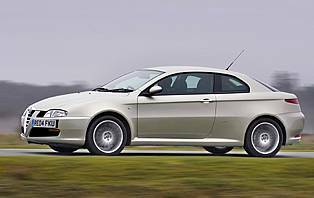 Alfa Romeo is a car brand of two halves; on the one hand its recent products have generated much acclaim for their looks and driving abilities, but on the other hand the marque remains hobbled by perceived and actual quality issues. However, a surprising number of buyers are often willing to overlook the latter when cars like the GT prove so attractive. Irrespective of the presence of two rear chairs, the GT is really a two-seater with an expertly upholstered rear bench. That much is true if you ever brave the trip to the rear compartment. Despite the front seats folding forward, it's a struggle for all but children to gain access. And once installed, legroom is modest at best. Front seat passengers fare better, yet the low seating position will make egress a challenge for some. Thankfully the GT's rear hatch is straightforward, if a little on the small side. The standard unit performs well, although drawbacks include its fiddly controls, small buttons and red backlighting. Thankfully the basic functions are duplicated on the steering wheel. The CD player element can be supplemented by an optional disc changer, while the top of the line optional satnav boasts a colour screen and easier to use controls. For many Alfa enthusiasts there is only one exterior colour: red. True to form, the GT looks the best in this bright hue. If you want less attention, the other options are fine but less flattering. Although more subdued inside, the GT's predominantly black interior works surprisingly well – especially when combined with the luxurious pleated leather seats. The splashes of bright work around the fascia controls help lighten the ambience a touch, though. While the GT isn't a large car, it can be difficult to reverse park due to a small rear screen and raised rear boot lid. At least the car's steering is light and quick at low speeds. Alas its door mirrors could be bigger and, as a casualty of its aggressive exterior looks, the rear three quarter view is also on the small side. Petrol engines: 2.0 JTS (165bhp); 3.2 V6 24v (240bhp). Diesel engine: 1.9 JTD 16v (150bhp). Transmission is five-speed manual on JTS, six-speed manual on 3.2 V6 and 1.9 JTD. Selespeed semi-auto transmission is optional on 2.0 JTS. Trim level is determined by engine choice.